These are the wandering gas clouds of zangarmarsh. they contain motes of life, gathered with the Zapthrottle Mote Extractor (http://www.wowhead.com/?item=23821). If you're lucky, a swamp gas cloud will be spawned near the mechanical/gnome boss in Steamvaults. Pretty sure this can be farmed by rogues, too - I don't think there are any stealth detecting mobs on the way, and the cloud definitely wanders out of aggro range of the boss. 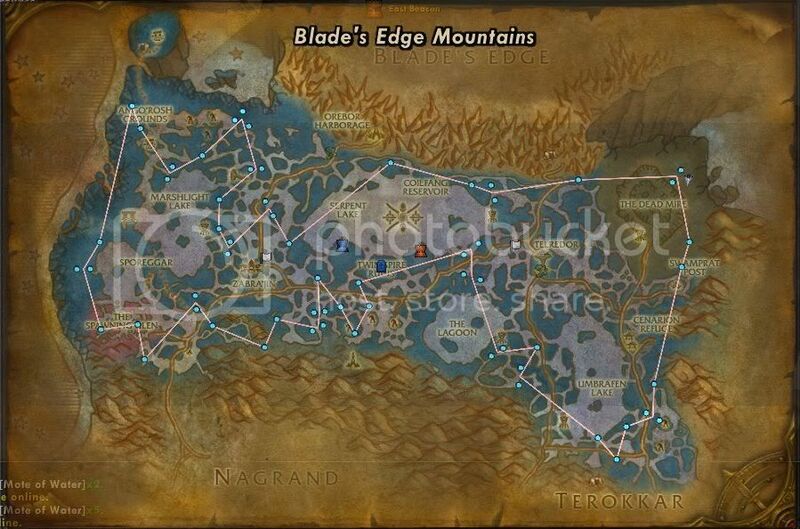 That's my farming route as of patch 2.4.3. The red star's are clouds that other people have noted, but which I have yet to find. Getting 10-15 primals an hour using this route. Enjoy. This is my current swamp gas farming route. It has more nodes than the one above. I'm also adding new ones here and then. Almost every node on this route was looted. Very easy to get 10 and more primals per hour. Enjoy! Despite countless reports of sightings, the Outland Government actively denies the existence of swamp gas. They insist the relevant phenomena is, in fact, a mere UFO. TomTom cords for the swamp gas in zangarmarsh broken into 2 macros. Feel free to comment and add more. There might be duplicates with some of odorous' coords, but these are ones i found. Thx for your coords Odorous.